To me, being the best means proving to yourself and your piers that you try your hardest at whatever you want to accomplish. So if you want to be a runner, you practice running every day. If you want to be an artist, you draw every chance you get. And if you want to read an interview, read this one I did with my mate Emilio, as it's about his comic book, Sara Rising. 1) What are your own origins, Emilio? By trade I am an attorney and a college professor, and I have always had a love for comics, reading them religiously since I was a kid. When I was younger I had aspirations to be a writer but then I started my career and it became my focus. The burn to create stayed within me, and at the NY Comic Con a couple of years ago I met a member of the Comicbook Artists’ Guild, a now defunct organization that I am looking to revive and modernize. Due to the fact I happened to be looking for an artist and collaborator, it was a serendipitous meeting. It was at the CAG meetings in early 2012 that I met my partner and collaborator, James Rodriguez, a graduate of the School of Visual Arts here in New York. From there we hit it off and have been creating together ever since. 2) What inspired you to create, ‘Sara Rising’? Sara was originally James’ creation. I was looking for a partner to draw a book and James already had 26 pages on the web of a book called, “The Chronicles of Sara”. I read the book and did not like it. During one of our meetings I articulated why and decided to write a script for him to better illustrate what I felt the book should be about. In that script I overhauled the entire story, even introducing a new antagonist. When he read the script, he saw what a writer could bring to the table and liked the ideas. To his credit, he was able to see that putting out the best possible book was what ultimately counted. 3) In your own words how would you describe this story? 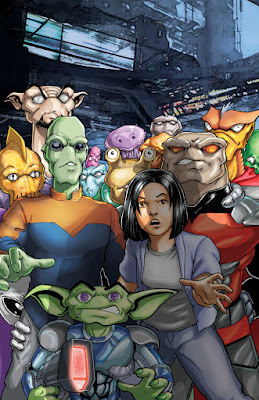 It is a special story about a teenage girl, an alien bounty hunter, alien gangsters, an adaptive bio-weapon, and an evil fast food manager. 4) What song would you say best represents this comic and why? A song called “Believe It Or Not”, which was the theme to a popular television show here in the states called “The Greatest American Hero”. Basically it was about a man who came across a group of aliens who left him a briefcase. Inside the briefcase was a red suit with a cape that endowed the wearer with super powers. The catch was that the briefcase came with a set of instructions for the suit, which he lost. He then hooks up with an FBI agent and solves cases with him, all the while comically attempting to figure out how to use the suit properly. The show shares similar elements with Sara’s story, but it’s the lyrics to the song that really apply to her. The song talks of someone’s dreams suddenly coming true, which is what happens to Sara. Instead of just dreaming about these far away places, she gets to visit them and undertake adventures she never knew were possible. 5) If you could get a celebrity – either living or dead – to promote your wares, who would you choose, and why would you want to choose this particular person? I would choose Zoe Saldana because she and Sara are confident, strong-willed Latinas, and, even though the story has nothing inherently to do with anything Latino (after all, it mostly takes place in outer space), it would please us to know she approved of the story and the character. 6) What have you learnt about yourself through this endeavor? I have gladly learned that I (and my partner) have an unflinching determination to put out the best books possible and we both hold ourselves to an extremely high standard. Most importantly, we feel our books reflect this. Too many self-published indie creators put out their “D” efforts (sloppy storytelling, riddled with typos, grammatical errors, etc.) instead of their “A” efforts, and are proud of themselves for it for some unknown reason. Not us. We constantly review and check ourselves, and are constantly looking for ways to improve what we do. 7) During your time in this field, what is the one thing that has kept you in good stead? The unflinching adherence to a high standard is what I feel has kept me in good stead. All creators realize how much work it is to do what we do. It would be easy to lazily put out a substandard product. Having a good book to back us up brings legitimacy to what we say when we are amongst our fellow creators, imploring them to not settle and to put out their very best. After all, we are fans first and foremost and love to read good books. 8) If ‘Sara’ had a motto, what would it be? Everything is choice. Choose wisely. 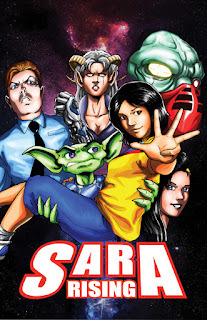 And on that note, I'd like to thank Emilio for telling us about his comic book, Sara Rising, before directing you towards his official Tres Calaveras Studios website and twitter pages.